It’s freezing cold, with a heavy fog and light drizzle, which mean I can’t even see the wind turbine site as I drive over the bridge onto the Isle of Sheppey. It’s not looking a promising day for aerial video, but a month of planning on our part and years of planning for the company have come to this day and we’ll just have to make the best of it. We have approval from the land-owner and the risk assessments are complete and approved by the construction company. As I drive towards the site I can just see the two turbines looming out of the fog. 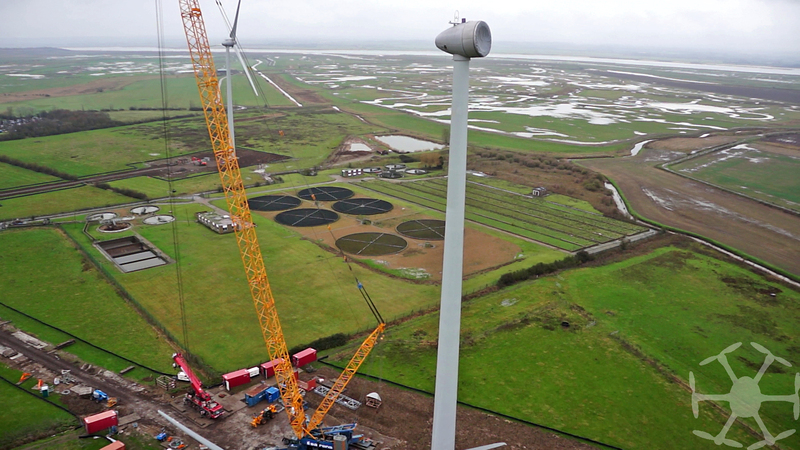 Scarily big but, at 121 metres, their blade tips will be just below our maximum working height. My safety induction is completed by the site manager Paul and I am issued with my hard hat. While I wait for the rest of the video team to arrive I go through my equipment checklist and prep the octocopter for flight. There are two turbines on the site. 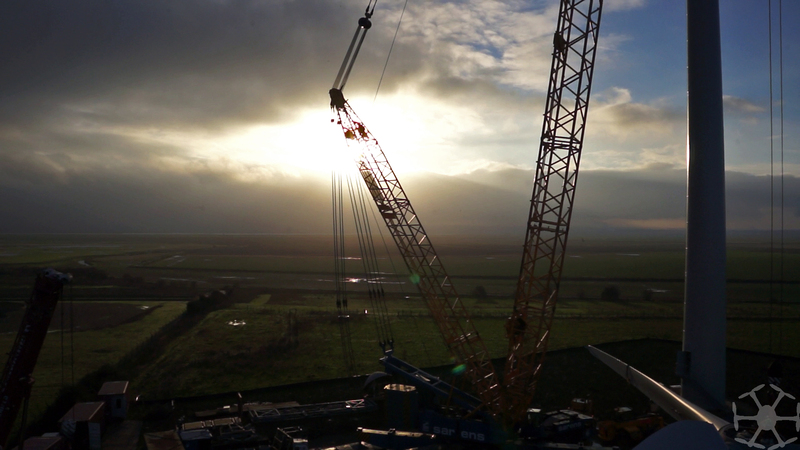 The blades of the first turbine were lifted in December so it will make a good backdrop as the next lift happens. As we look out onto the damp site we can see the crane holding first the 40 metre blade against the hub while the team of engineers fix it into position. All three blades will need to be fixed before the lift, which is scheduled for around midday. Hardhats don’t suit me. All PPE’d up and ready to go! Stewart and Martin from One Planet Media arrive bearing bacon sandwiches and GoPros. They have been following the project for months, creating timelapses and recording significant stages of the project. It is our first time working together, so we recce the site discussing good angles. It’s stopped raining, but visibility is still pretty poor and I need 5km visibility to fly! As forecast, the fog begins to move away and suddenly we can see the reason for the choice of site, I can now see the bridge back to mainland Kent and the industry surrounding this low-lying part of the Medway estuary. There is nothing to stop the wind here! Fortunately for us and the site team, the wind speed is forecast to be very low today. Now visibility is good, I carry out my first test flight of the day. I calibrate the octocopter and it achieves full GPS signal very quickly. I fly it a few times around an adjacent field, testing response to all controls. It feels very good today following minor adjustments over the Christmas break. Looking good! The second blade is now being fixed to the hub so we know it is going to be at least two hours until the lift. Stewart decides it would be good to get shots of the first turbine just in case the lift doesn’t happen today. So I walk the equipment to the site. As the octocopter rises I can monitor the exact height. I very rarely work above 50 metres for most projects but on this flight I top out at 115 metres with the octo now a little dot next to the immense turbine. On return to the site office I download the footage immediately to the laptop. I do this after every flight just in case I should damage the camera with a heavy landing. 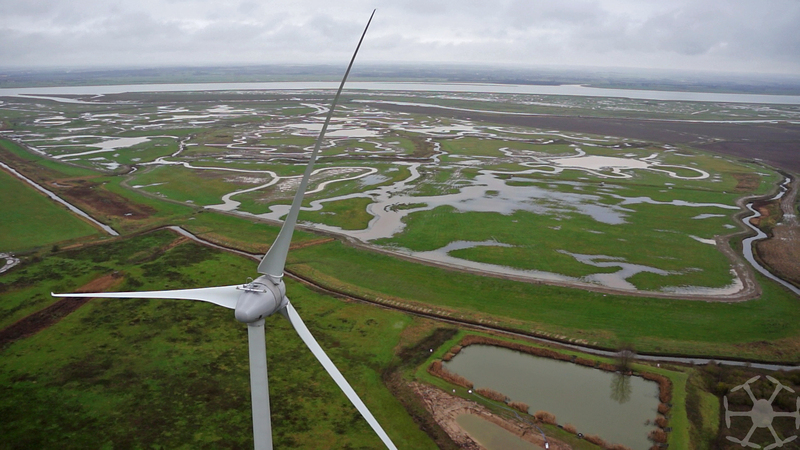 The footage looks good with the sleek blades against the background of the Sheppey marshes and the Medway. Although the light is still poor it is rapidly improving. Happy that we have some good footage already, I put the first set of batteries back on charge. The site team are great and it’s hot coffees all round. Blade three is now being manoeuvred into position. This is precision engineering at its best; with over 200 bolts holding each blade to the hub, it takes time… and the biggest spanner I have ever seen! The riggers take a well earned lunch break with the hub now complete and ready for lift. There is a rumour of a patch of blue sky but that is quickly dispelled, although Dave, part of the site team, says he has ordered sunshine for the afternoon. With the site empty, we take the chance to carry out some tests of angles for the big lift. The octocopter is flying beautifully today in the low winds, giving a smooth overflight of the blades and hub lying ready for the lift and easily coping with drifting along at the 80 metre nacelle height. 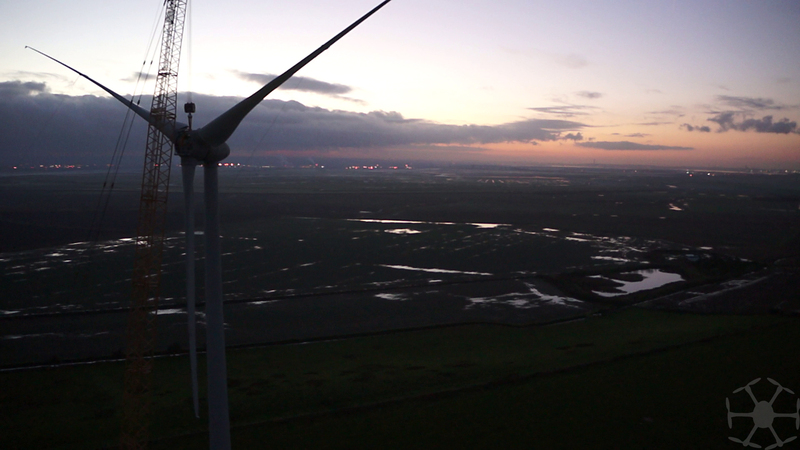 We test angles with the complete turbine in the background. The 80 metre high turbine nacelle covered but ready to receive the hub. Dave was right! A patch of blue sky appears behind us and begins to expand as the painstaking task of rigging the hub for the lift continues. It is only when you see the team working around the hub that you realise how big it really is. Wind conditions are perfect and the lift will definitely happen today but the timings now mean that it is a race against time with sunset at 1610. We wait, as the temperature begins to drop and the blue sky expands. 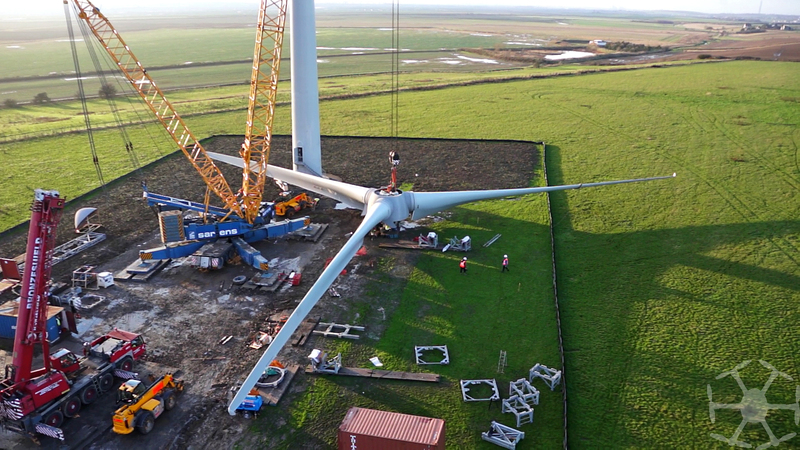 The 40 metre wind turbine blades fixed to the hub and ready to be lifted. Finally, everything is nearly ready to go and at that point the sun breaks through the retreating cloud for the first time today and I can’t resist a quick flight to make the most of the light. Although the sun has just appeared, it is rapidly descending so time is still against us. Time means nothing any more! We are losing all hope of being able to film in the light, and possibly film at all as I am not permitted to carry out night flights, but suddenly the lift begins. The tarpaulin is removed and drawn into the nacelle as a fearless rigger sits on top of the nacelle unhooking it! I ascend only to find that my lens immediately steams up due to the decreased temperature. Not wanting to miss what we have waited for all day I bring the octocopter rapidly back to the ground and use a chamois to clean the lens. Off we go again, capturing the blades lifting against the dying light. It all moves very quickly now and, when the 100 tonne blades are vertical, I land the octo for a final battery change. I take off again and bring the octocopter round to capture the the final lift into position. Unfortunately it is getting just too dark to see the two riggers sitting in the mouth of the nacelle waiting to secure the hub into position. As I land, the last of the light is fading away and, although the camera struggled slightly in the dark conditions, we seem to have captured some great images. Dusk falls as the blades and hub being held in place by the crane while two engineers fix it in place from inside the nacelle. We trek the muddy equipment back down to the site office and pack it away as the video clips download to the laptop. Stewart magically materialises hot bacon baguettes and steaming mugs of tea which are incredibly welcome as the temperature has dropped considerably over the last hour. With the footage transferred and backed up, it’s time to go home. All being well there will be good footage to use in the project. I drive across the bridge and, looking back, can just see the floodlit turbine site as the riggers continue to secure the hub so the crane can be removed. It was great to work with such a well organised team and I look forward to seeing the turbines in action next time I’m in the area. ← Please use companies that have a CAA permission for aerial work!